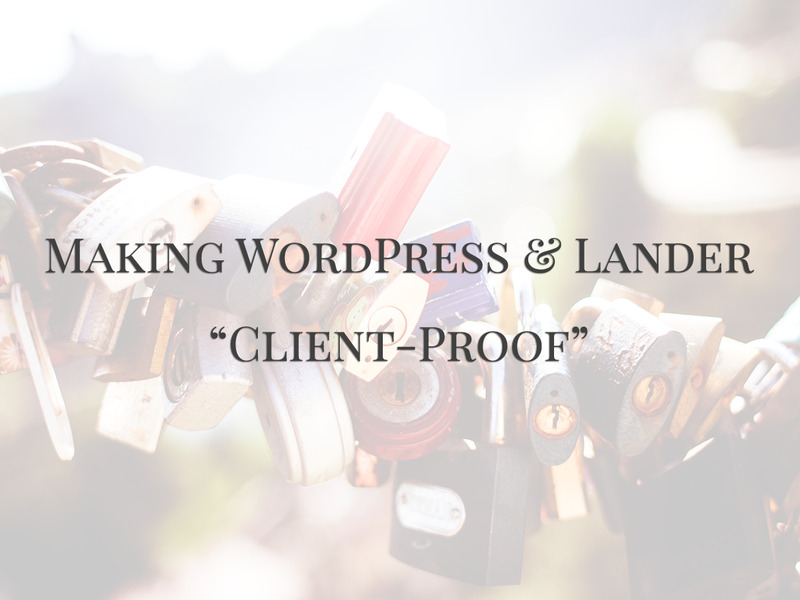 As WordPress developers, we have come across the clients who love to tinker with WordPress and more often end up breaking the site. Sometimes the menu item goes missing and the other time the contact form vanishes. Moreover, if you are using a theme which offers the options panel or if you have built the site using one of those page builders and your client gets creative with it… you will end up doing more work fixing the site than expected. We had these concerns in mind even before we started building Lander. We designed Lander intelligently with all the developer features in place. Lander offers robust settings and options to make it easy for the developers to build the websites powered by Genesis. And Lander addresses the concerns of the developers by offering the ability to deploy Lander in stealth. All the Lander features can be locked and their UI can be hidden by a mere call to add_theme_support or remove_theme_support. Lander settings panel includes all the admin settings like design selector, widget area configuration, global mobile template settings and debug tools. To hide Lander settings panel, add the following line of code to your design’s functions.php. Lander design settings panel features design controls for setting layout widths, layout styles and typography settings (font-family, font-size, color, etc). To hide Lander design settings panel, add the following line of code to your design’s functions.php. Lander Branding settings enable you to upload favicon and header image for the site. To hide Lander branding settings, add the following line of code to your design’s functions.php. The best part of hiding Lander settings is that even when you hide the settings panel and meta-boxes, the settings are preserved and you can enable them in case you want to update the settings later. You may mot want to give complete access of WordPress admin area to your client. If that’s the case, you can create another user, assign “administrator” role and depending on client’s technical know-how disable the admin menus for specific administrator. Check out this neat cheat here. WordPress hosts a file editor in the back end (Appearance > Editor) which allows you to edit theme and plugin files from the admin area itself. These files are very sensitive and one wrong edit can potentially crash the site. It is advisable to disable the file editor before handing the site to the client. If your theme defines multiple widget areas and you are not utilizing those widget areas in the design, it is better to remove them. For example, Lander defines 3 widgetized CTA areas (Before Header, After Header and Before Footer Widgets). If the client’s site design doesn’t utilizes these areas, I generally prefer to unregister these widget areas to avoid any kind of confusion for the client. Genesis provides six layouts and Lander supports all of them. Before handing over the site to the client, I review the layouts and unregister the layouts which are not the part of the website design. What steps do you take to make ensure that WordPress admin area is safe for your clients?